KNOW YOUR BIBLE is a comprehensive and detailed encyclopedia of Bible understanding in 92 volumes with 350 pages in each volume. It has 9,056 extensive articles covering every person, place, thing, event, animal, place, country, land, nation, priest, king and prophet etc. within the Bible record. It contains detailed overviews of all 66 Bible books. It is delivered as ePub files in color on eReaders that support it. It also has indexing for quickly locating the desired article and moving to it quickly on eReaders that support indexing. Download a free sample file in PDF format to see how all the articles are formatted and ogranized. View a Sample PDF Article on SPIRIT. KNOW YOUR BIBLE also contains thousands of spiritual word study articles covering every occurrence of a given spiritual word in the Bible record with commentary, explanations and background. Each numbered volume contains roughly 350 pages and each volume costs $2.99. If it is found within the Bible record, you will find abundant information concerning it within KNOW YOUR BIBLE! KNOW YOUR BIBLE is all beautifully formatted in color, and it uses standard colors to denote various textual aspects like article names and sub-headings, foreign language words, definitions and bibliography. It shows in thousands of places, different Bible translations JB, NW, KJ etc. that concur with a certain reading or understanding. Within KNOW YOUR BIBLE all 231,000 scriptural references within the entire work are already looked up for the reader, and set apart in formatting, so as to show the difference between God’s words and mans'. It makes Bible study and research a delight! You will never again have to hunt around to find material in support or proof of any point, and you can speak with authority on any Bible subject. KNOW YOUR BIBLE is clear of excessive punctuation and abbreviations and is designed for the reader, with clear text, consistent color formatting and large enough print to read easily. It has definitions of all words, most in their native languages, like Hebrew, Greek, Aramaic, Latin and English. Foreign words are always shown in context to aid the reader to see how to understand many verses. KNOW YOUR BIBLE uses a modern language literal translation in English to show all referenced scriptures. It is a direct translation from the Hebrew, Greek and Aramaic, and it is easily understood. Yet any translation can be used for all the scriptural references are also given. KNOW YOUR BIBLE covers 30,600 pages and 1.35 million lines of text. It has been divided into 92 volumes to make it easier to get at the correct information quickly. 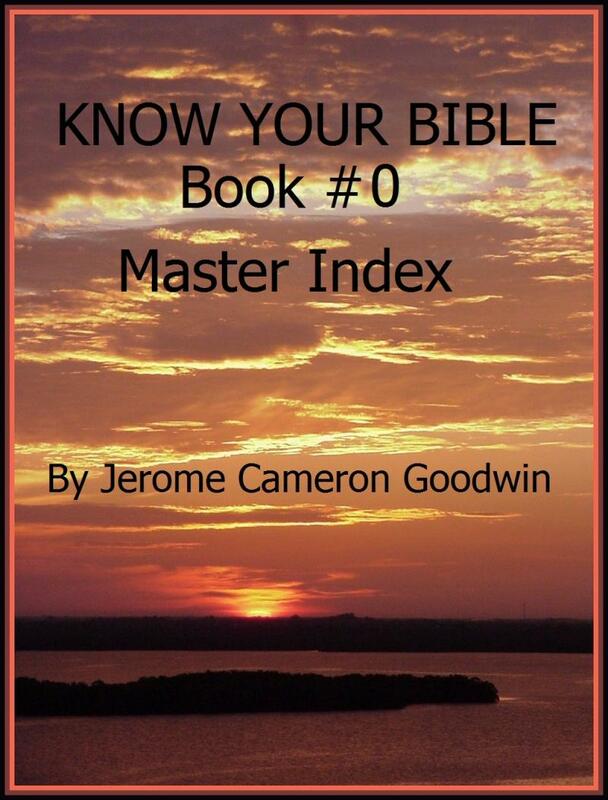 Readers may use the KNOW YOUR BIBLE MASTER INDEX, which is available for free below by following the supported links, to see all of the Headings and Sub-headings within the entire INDEX (337 pages), and to find articles of interest, and which volume their search word may be found within. The (~) marks the Headings for the articles and the (••) marks the Sub-Headings within articles. The (203) numbers represent the number of lines of text within each article. Readers may buy the individual Books comprising this library one at a time or the entire book altogether, their choice. Please take the time to download a sample of one of the BOOK articles on ﻿JESUS CHRIST﻿, for it is the most comprehensive and beautifully formatted Bible encyclopedia you will ever use. See the INDEX below to explore the entire work and see how comprehensive its coverage is of the entire Bible record . Hebrew the word ´avaddohn' = Foreign Language and word. Abaddon = Article Keywords occurring within the article. Look through the Articles and their Sub-headings to see if the information you are seeking is contained within the article's contents. The number (1305), as an example, represents how many lines of text are contained within the article. If you find what you are looking for then you can follow the links there to Barnes And Noble or Amazon to purchase the document(s) in ePub format. All KNOW YOUR BIBLE segments cost $2.99 on both sites and they contain approximately 350 pages of information in each file. KNOW YOUR BIBLE looks best on the Nook software which reporduces the colors and does a better job of formatting the text the way it was designed to look. The Nook software presents these eBooks closest to the way that they were designed, and you will have a better reading experience through it. If you find what you are looking for then you can follow the links there to Barnes And Noble or to Amazon to purchase the book(s) in ePub format using your existing Barnes And Noble or Amazon account, or you can create an account quickly on the fly. All eBook orders purchased will be fulfilled through Barnes And Noble or Amazon and delivered to your Nook, Kindle, Tablet PC or Phone electronically. Orders will be filled within one minute.